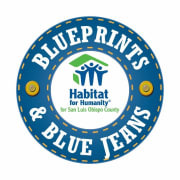 Help Habitat for Humanity for San Luis Obispo County with our Blueprints & Blue Jeans fundraising event! This event supports Habitat’s work in the community, ensuring that we can help low-income families in the County to purchase homes through 0% loans, maintain the homes they already own, and transform lives by promoting positive social and economic change throughout the County. Volunteers direct guests to the venue, check-in & out guests, assist with the silent & live auction, take photos and serve the formal dinner. This is a fun opportunity for teams and individuals! A Habitat Volunteer T-shirt will be provided. Lunch/dinner will be provided during most shifts. Please wear closed-toed comfortable shoes and dark jeans. NO dangling jewelry, sleeveless shirts, or open-toed shoes allowed on Habitat projects. Volunteers must be 18+. Location is wheelchair accessible. Please wear closed-toed comfortable shoes and dark jeans -NO dangling jewelry, sleeveless shirts, or open-toed shoes - Volunteers get orientation/training, support during the event, pizza dinner, and a Habitat t-shirt!